Provide comfort for the family of Randy Hodges with a meaningful gesture of sympathy. Randy Lamonte Hodges was born April 18th 1973 in Toledo Ohio to Author and Susie Hodges. 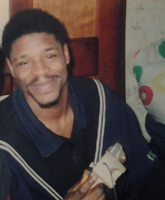 He was peacefully called home on Wednesday March 8, 2019 at the age of 45. Randy was born into a big family and was the baby boy of his siblings. He was a loving and free spirit. Although he battled epilepsy, you could always catch him smiling a, telling jokes, and laughing. He was a father who loved his children and very family oriented. Randy is being remembered most for his artistic ways. Everything about him was art! He loved to sing, rap, draw, write music, sew, and reconstruct things. He was known all over Toledo for his unique barber skills. He was preceded in death by his mother, Susie Hodges; sister, Catherine Williams-Jenkins, and niece, Charvita Williams. His legacy continues through his sons, Corey Littlejohn, Dominique Littlejohn, Randy Hodges Jr. and Raymond Hodges of California; daughter, Alexis Jones; father, Author Hodges; brothers, Ben (Vita) Williams, Lawerence Williams, James (Chris) Hodges, Authur Hodges III, Alice (Louis) Hodges-Legree, Belinda Hodges and Brenda Hodges all of Toledo; and a host of nieces, nephews, great nieces and nephews, uncles, aunts, cousins and friends. To send flowers in memory of Randy Lamonte Hodges, please visit our Heartfelt Sympathies Store. Provide comfort for the family of Randy Lamonte Hodges by sending flowers.